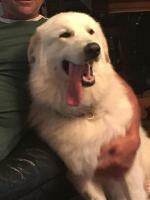 I haven't had a puppy in years and never one as sweet as my one year old mellow male Pyrenees. I worry that his sleep might be off as he seems so calm. We take good walks daily, sometimes two. We walk from 2.5 to 4 miles of hill climbing. I try to have him have play dates with other larger dogs, off leash for a half and hour to an hour or rigorous play at least 2 times a week. 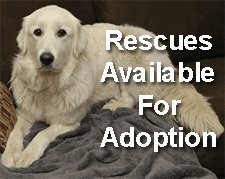 What is the normal amount of sleep a pyr needs or takes as a one year old? We had a good walk yesterday and today he is not so interested in playing actively. Is that ok? Thanks for your help... I am madly in love with my 'Apollo' and want to be sure he is getting all he needs. 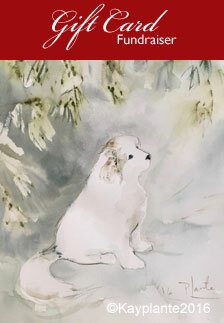 My last dog was an Akita...quite different mentality..
Jennifer in the Pacific Northwest. 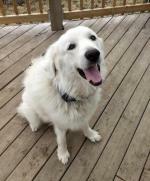 Pyrs are very mellow dogs although pups do like to play but it sounds like your guy gets lots of exercise which is super. He's tired and understandably so. He'll sleep when he needs to. If you are really concerned, you might consider taking him to the vet for bloodwork to ensure everything is in order. I honestly would warn you that is to much excersize for a one year old. 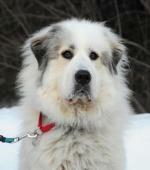 Great Pyrenees are giant breed dog and there for grow for 18 to 24 months. His joints are not yet fully formed and his bones are still soft. Excersize is great but at his age let's literate a bit more. If you go to far and after a good night sleep he is still pokey he is more then likely he is acheing. Over excersize can lead to premature arthritis, hip displasa later in life and platelets that don't develop correctly into joints. And if he is a ready neutered some of this can be prone to him now. I know he looks big and strong and he is but under that is a puppy a big still forming puppy. Other large dogs jumping and landing on him are your worse enemy. Trust me I am on the 3rd Pyrenees, I have had a English mastiff, a newfie, and 4 forties. Not one has had hip displasa. All my dogs except one were rescues so I am ether very very lucky or doing something right. 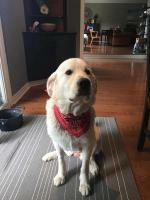 Best quality of food (and only doog food) the first two years and monitored play with other large dogs and limit walking to 2 miles per section two to three times a day. Last keep the puppy trim. In two years your boy will be ready to take his rightful place in the dog world. 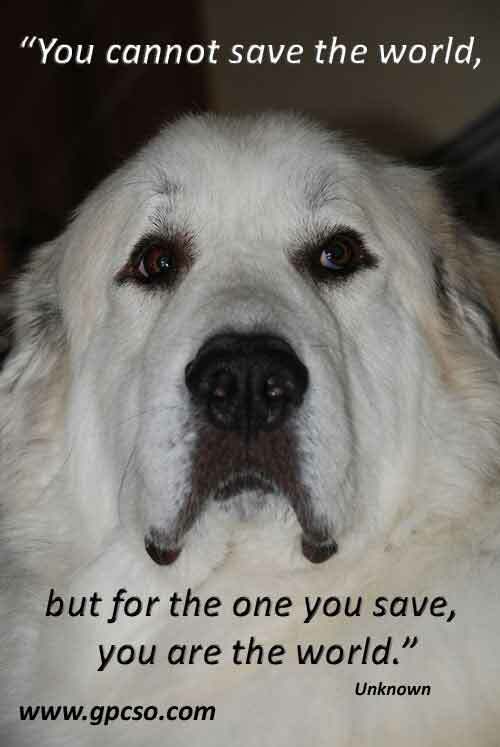 Kudos for being an exemplary Pyr parent. You are obviously striving for the very best for your very lucky dog. Dogs generally sleep at least 12 hrs/day; young dogs a bit more. It's important that his sleep is undisturbed as much as is possible. If he's asleep when you are ready for your run, I would advise letting sleeping dog(s) lie until he's ready to get up and go. Pyrs are, in general, more laid back than other breeds. They conserve energy for those times when, as a guardian, a burst of supersonic speed is required to neutralize a predator threat. Energy conservation became important when the Pyrenees stayed mainly on the mountain slopes with the sheep, when they fed themselves and stayed out in all weathers. Your pup doesn't live that life, but he is genetically still programmed to be able to do so. The free play with another canine his size and age is the best exercise for him. No need to overdo the really long hikes or runs...he is too young for that much stress to be put on young bones and developing joints. So, listen to him. If he's reluctant to go with you there's a reason. He's too tired or his bones ache. Take it easy with the hill climbing until he's at least 2...better 3... yrs. old. 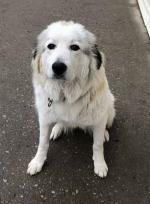 That way you will have a sound of limb and happy healthy Pyr companion for many years. Enjoy the ride, as they say!! I thank you all tremendously for your feedback. It is true that his size has me thinking he is capable and even needs enormous work outs. I have succumbed to tearing out the old sheep fencing and replacing it with no climb 5 foot wire on the 5 acres here so he can be off leash more and sort out his own level of exercise on most days. I am keeping his play dates to 2 times a week with the other sweet females he likes. He is a real sweetie. And golly even though he is responsive to training i.e. sit, lie down etc I can see the pyr stubbornness streak. He's perfect!